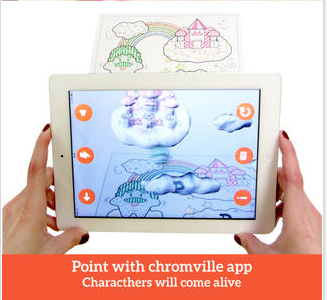 Chromville is a fantastic mobile app (Android/iOS) for using Augmented Reality to complete a fantasy adventure. The way this works is by downloading the free app and then printing out the pages to color. As a student colors one of the pages for the village they chose the characters come to life in 3D augmented reality via their mobile device. This is a innovative way to integrate technology into the classroom and a lot of fun for the students. I highly recommend checking out Chromville by clicking here!! !